Ironman races have a cut-off time of 2 hours for the swim. The world championship winning swim last year was 56:09. So, the maximum difference in split time from someone who barely finishes is an hour. Overall, someone who barely finishes and a world champion athlete should be around 9 hours. Or look at it this way. You can improve your time in one event by 10% by training extra hard. Which to you choose? I hope you didn't pick the swim, because even the slowest swimmer would only gain 12 minutes. Lance Armstrong ran a marathon in 2:46:43. How? Because he's thin and has strong legs. And he doped. But the point still stands, marathoner training and cycling are complementary. Swimming is not. Michael Phelps weighs 196 pounds, which is way too much for a triathlete. Training in the pool will leave you with a strong upper body, but no leg to show for it. Spending your time on either of the latter 2 events will help you prepare for the other. This swim doesn't really help you for anything else. Maybe you have a lap pool in your backyard, but I doubt it. Any swim session requires a lot of prep, going to a swimming venue, changing, training, changing back, and driving home. It suddenly makes an hour of training a 3 hour affair. You can run or cycle from the moment you're out the door. Better to get the minimum training in and then focus on what matters. Yes, I mean anyone. I would say that it is restricted to those who have two legs, but that would be and insult to the wheelchair and one-legged runners out there. Anyone can do it with a little training. 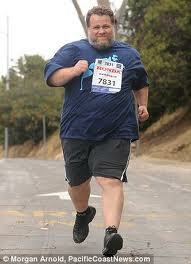 Kelly Gneiting holds the record the heaviest marathoner, with his race-day weight at 430 lbs. This former sumo wrestling champ has actually completed several marathons, and is planning on running even more. Think you're too old or too young to run? It's very unlikely you're older than Fauja Singh, 102, or younger than Budhia Singh, who completed 48 marathons before he turned 4. I could go on about the down-syndrome marathoners, the one legged marathoners, or the scarf-knitting marathoners (yeah, it's an actual world record), but you probably get the point. If these people can do it, so can you. How, you ask? Simple. Stat running. Run as much as you can, as often as you can. Don't focus on speed, focus on extending the lengths you can run. Repeat until you can run a marathon.